These Series H porcelain and ceramic grinding jars are of a very high quality. The porcelain used in the porcelain jars have approximately 40% AI2O3. The ceramic used in these ceramic grinding jars has approximately 96.5% AI2O3. 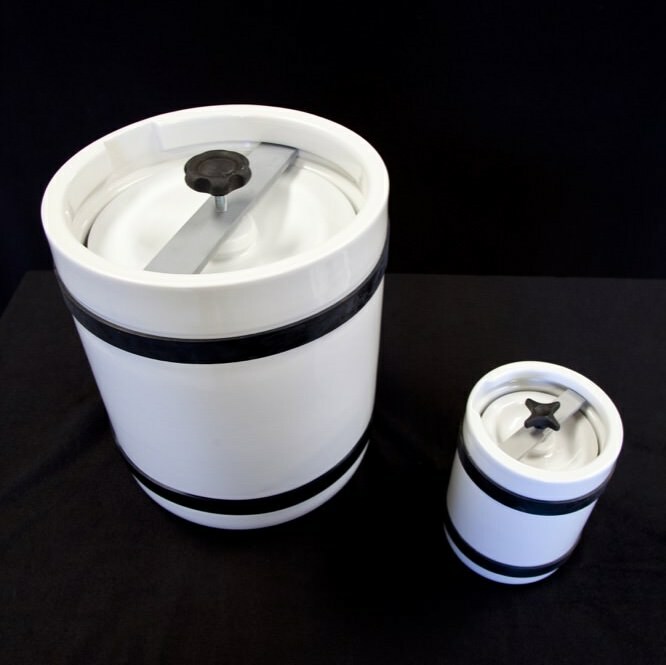 These grinding jars have a cover with a metal bar and hand wheel clamp to hold the lid securely in place. Jars are furnished without lifter bars. Ceramic lifter bars can be installed, as an optional feature. 010E-041 0 Porcelain Jar 5.3 In 7.3 In 0.3 G / 1 Liter 2 Lbs. 010E-042 0B Porcelain Jar 7.9 In 9.5 In 0.8 G / 3 Liter 7 Lbs. 010E-043 1 Porcelain Jar 8.9 In 11.0 In 1.0 G / 5 Liter 11 Lbs. 010E-044 1X Porcelain Jar 11.2 In 12.6 In 3.3 G / 10 Liters 22 Lbs.